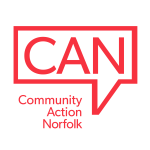 CAN’s partner, Momentum (Norfolk), will also be on hand to provide specialist advice on DBS checking and safeguarding practice and to distribute Safer Packs to Safer members. If you would like to collect a Safer Pack during your visit or would like to book a specific appointment time please contact Jim using the details below. getting funding for more in-depth support from us through the Big Lottery Fund’s ‘Village SOS scheme’? making energy bills cheaper – through Thinking Fuel, our oil bulk-buying scheme in partnership with AF Affinity or our consumer energy advice services? getting faster, more reliable broadband access – through Thinking WISP, our wireless broadband service? making a complaint about any NHS service? If you can’t make it to one of our drop-in sessions, come and talk to us at a time that suits you. Your CAN team in West Norfolk is Jo, Jim and Charlotte and you can contact them via the Dereham office, details below. Momentum (Norfolk) can be contacted on 01603 819135 e-mail [email protected].